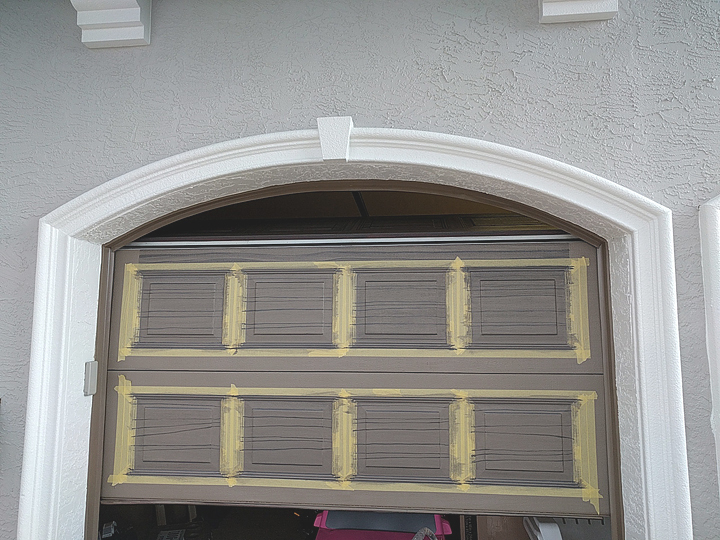 I finished up a new garage door job this week. 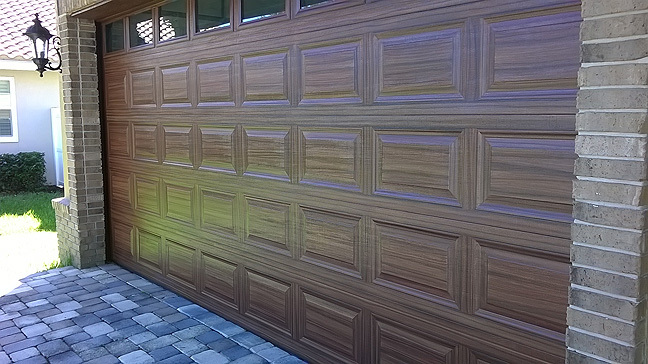 I painted three garage doors to look like wood, two single garage doors and a double. 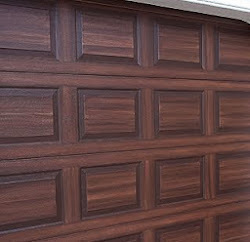 The color of doors is not typically a color scheme I use but I really like it. 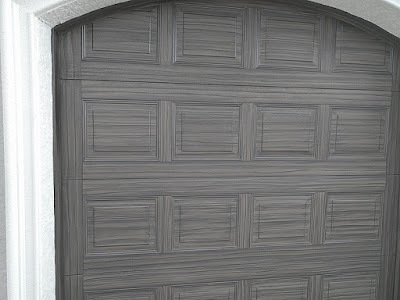 It is a grayish tone of wood. Not a driftwood color but on the grayish side nonetheless, goes perfectly with the new home color. The first picture here is a shot of the two single doors. 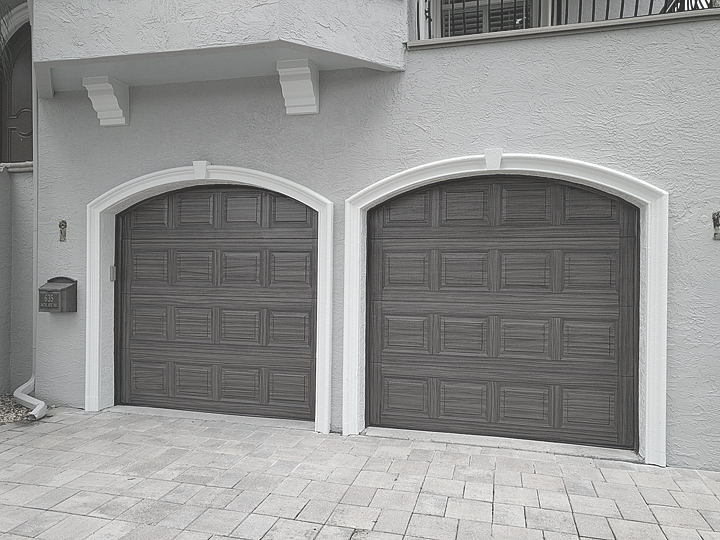 The doors are the standard 4 rows high but the rows are oversized in height so the opening is actually almost as high as a door with 5 rows. Plus as you can see the curved top of the opening creates a challenge. A portion of each panel on the top row is behind the curved top of the opening. 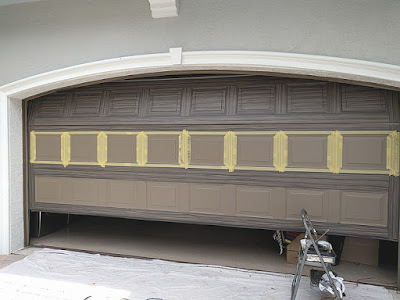 The best way to get to the top panels on a door that has the curved top opening is to open the door the whole way and then get on a ladder and paint the top row from inside the garage. This only works if there is enough clearance between the ceiling of the garage and the garage door when it is opened. Unfortunately most of the time there is not. The other way is to open the door just barely enough to where when it starts to go back and gets away from the opening it will curve back on the door track at an angle, stop it and paint the door by getting on a ladder and reaching in. I don't have a picture on this particular door of when I painted the top row but I did it by angling back the top row like in the photo below. In the photo the third row is angled back while I paint the bottom two rows but you get the idea of how it looks when the top row is angled back. You have to reach in and paint. It's pretty hard actually and I am sure unless you have experience painting garage doors to look like wood you could not pull it off. The photo below also shows how I tape off the bottom two rows to get them ready to paint. This next photo shows how I tape off the space between the rows for painting. The next two photos are of the completed single doors. This next photo is when I was putting the base coat color down for the wood graining. 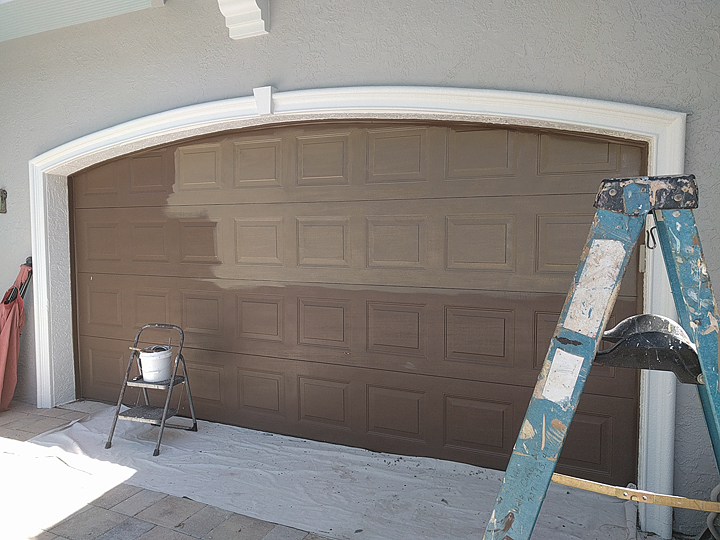 You can see how the door was painted a dark brown. 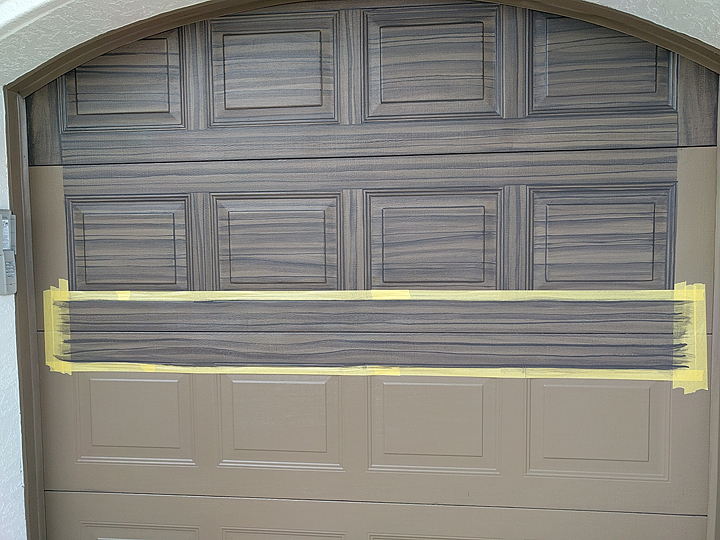 Here is a photo of when I had taped off the third row down from the top on the double garage door and I am ready to paint in the wood grain.